The Compact Set features detachable lid, extra mixing space, thumb hole for comfort in use, 14 Winsor & Newton Artists Quality Half pans and a size 5 Series 916 sable. I am sorry you are not happy with the colours in the set. We do list the colours included on the product detail page (click the COLOURS tab), although every so often they can be subject to variation. Mix feelings about this product, I have been meaning to try artist grade watercolours for the longest time now so I decided to get my hands on this compact kit from the famous W&N. The concept for this set is good but the execution was so so for what I paid. The pans didn't fit the slots, causing them to rock and sometimes even causing the pans to stick to the lid which leaves more to be desired especially spend around 100$ Aud to import them. The colour palette were hit or miss for me some colours I really found a use for yet and I just had them replaced with a different pan I got along with my purchase. Getting to the pros of this I did fine that the pigments were exceptional they lift easy and are vibrant almost like gouache. Also Ken Bromley if you added a AUD currency or better yet have Local Australian Suppliers that would be super. 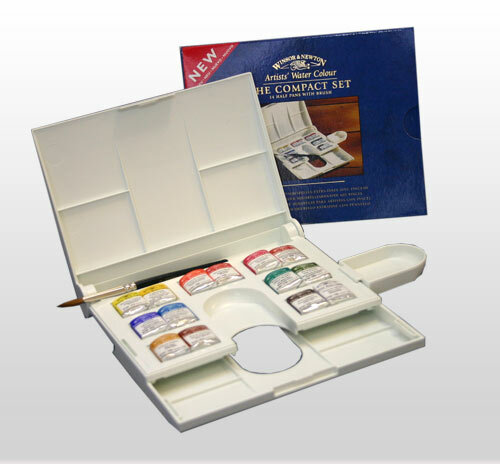 There seems to be a shortage in good artist grade supplies here so I reckon it would be good money, closest thing to good supplies we have here seems to be cotman stuff and its highway robbery on how much they cost!